Bernard's Tavern - 7pm / Benefiting Operation Feed. What's a "banger", you ask? That's a great question. Depending on where you live, it could mean a firecracker, a jalopy, or even one that enjoys Slayer. Whatever it means, DJ uses it constantly, on just about any noun he encounters. It's not a William Buford profile piece, it's a William Buford banger. It's not a flight across the Atlantic, it's a banger across the pond. 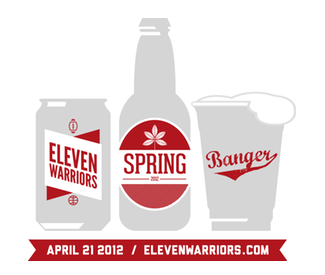 So, after soaking up Urban Meyer's first spring game in Columbus, please join us Saturday night at 7pm for suds, food and banging times at Bernard's Tavern in the Short North [Map]. We've partnered with the Mid-Ohio Food Bank, so if you show up with an essential food item, like chili, canned fruit, tuna or peanut butter, you'll get a wristband. This wristband shows everyone that you not only care about the hungry, but that you also enjoy saving money on your tab. We'll see you Saturday the 21st. WHO: You. Your friends. Their friends. WHY: To collect food for the Mid-Ohio Foodbank [Shopping List]. Oh, and to have a good time.